There are many, many adventures to tell: winning pool tournaments in Vancouver, how Ellen got the nickname “Ace” playing cards in Portland, winning the spaghetti cook-off in Santa Fe, sailing from Key West to the Tortugas, staying up all nite in NYC toying with the world, after midnite crashing the rooftop swimming pool in Chicago, making love in all the right (wrong) places, but they’ll all have to wait for another day. Suffice for now: we were deeply “in like” heading to deeply in love. I had first gotten elected in 1987. Ellen, me and a million others got Wellstone elected in 1990, which was also a “re-districting year.” The legislative maps for where you have to live if you want to be elected are redrawn every ten years based on population shifts. Each District has to have approximately the same number of people. By now I’d gotten an appreciation not just for how much fun it was hanging-out with Ellen, but also a pretty good impression of her acumen for politics, her braveness and her smarts. 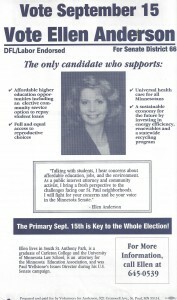 Me and others encouraged Ellen to run for office. Later I learned from her friends, she’d said, “Well, if he can do it, I can do it.” - but she meant that as a compliment on my ability to de-mystify politics. 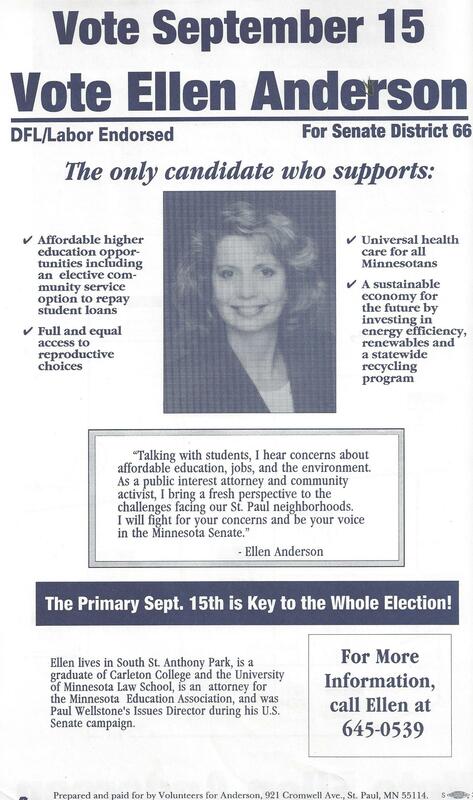 Like I said, it was re-districting time and this conservative East Sider (of Saint Paul), the leading #1 pro-life champion in all the Senate, was re-districted into the district where Ellen lived for his ’92 re-election. Ellen, if you haven’t guessed, is fiercely pro-choice and a staunch progressive, like many other west-enders. Perhaps the East Sider is no longer a good fit for the new District. But taking-out a twenty year incumbent is not easy. Ellen was the first to announce and the rest is still history in the making, although, like me, she was decidedly the underdog starting out.